Manufactured for use within offices and factories that meets the needs of the German telecom installers and increasingly their European counterparts. The larger conductor sizes, the lower signal losses compared to traditional CW1308. 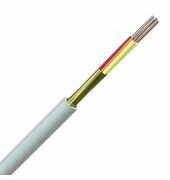 The foil screen reduces the interference either radiating from or picked up by the cable. Solid copper wire conductors to IEC 60228 class 1, PVC insulation, overall foil screen in contact with solid copper drain wire, PVC sheath – grey. J-Y(St)Y can be also comes with a red outer jacket for identifying fire alarm systems that do not need to meet British building regulations, please put ‘03’ at the end of the part number to specify this cable. Also available unscreened as J-YY.